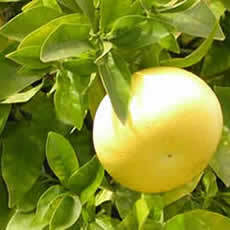 Grapefruit is a hybrid fruit made from mixing pomelo and sweet orange. There are three common varieties available: red, pink, and white. The names are based on the color of the fruit's pulp. 1-2 cups of white grapefruit juice potently inhibits Estradiol 17beta-dehydrogenase Type 2 (17bHSD2). Inhibition lasts approximately 4-8 hours. naringenin (31.2 mg/L ) is an potent inhibitor. quercetin (4.9 mg/L ) is an potent inhibitor. Anecdotal reports indicate that 2 cups of white grapefruit juice consumed 30 minutes before taking allylbenzenes will greatly reduce the psychedelic effects of allylbenzenes and delay their onset by up to 8 hours. The enzyme 17bHSD2 is required for allylbenzenes to produce psychedelic effects. Grapefruit juice potently inhibits this enzyme for 4-8 hours. See the article Oilahuasca Activation for more information. Among the varies types of grapefruit, white grapefruit has the strongest effect on P450 enzymes. 1 cup of grapefruit taken 3 times a day by human volunteers was found to inhibit CYP3A4 in small intestine (small bowel) epithelia (enterocytes) by 62%, but had no detectable effect on liver CYP3A4 activity, colon levels of CYP3A5, or small intestine concentrations of P-glycoprotein, CYP1A1, or CYP2D6. Grapefruit oil was found to inhibit CYP3A4 in vitro, but not CYP1A1 or CYP2D6. Tests in humans are lacking for grapefruit oil but these results mirror those of grapefruit juice tested in humans. CYP2B6 Potent Inhibition 1-2 cups ? 4. Br J Clin Pharmacol. 1999 Oct;48(4):543-52. 6. Chlorzoxazone, a selective probe for phenotyping CYP2E1 in humans. 7. Effects of clarithromycin and grapefruit juice on the pharmacokinetics of glibenclamide. 8. Grapefruit juice increases felodipine oral availability in humans by decreasing intestinal CYP3A protein expression. 9. Mechanisms of enhanced oral availability of CYP3A4 substrates by grapefruit constituents. Decreased enterocyte CYP3A4 concentration and mechanism-based inactivation by furanocoumarins. 10. Effect of grapefruit juice on cytochrome P450 2A6 and nicotine renal clearance. 12. Variations in content of active ingredients causing drug interactions in grapefruit juice products sold in California.